Michelin is introducing the Tweel - a combination of wheel and tire that could offer a number of benefits to owners of wheeled vehicles. 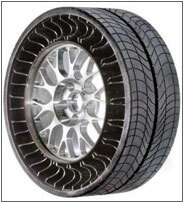 Unlike most Michelin tires sold in the past century, the Tweel is unique - it does not use air to cushion the ride. The injection-molded polyurethane spokes are flexible; this allows them to effectively absorb impacts by "shortening" (i.e., bending) when hitting a bump. The key advance that this system offers over a tube of air is that it separates several important ride characteristics. Lateral stiffness improves cornering; the only way to get that with a traditional tire is to increase tire pressure. Unfortunately, when you increase tire pressure, you ruin another important characteristic, namely, ride comfort. The Tweel can be engineered to give five times the lateral stiffness as a pneumatic tire without any loss in ride comfort. As an aside, its about time somebody improved on regular wheel spokes, which were introduced in about 2700 BC (before that, people used solid wood wheels). You might be interested in another development in robotic wheels with variable shaped spokes - see Soft Robot Powered By Shape Memory Alloy Spokes; they have a wheel rim made of elastic polymer. Read details about the Tweel at Reinventing the Wheel (and the Tire, Too). Thanks to alert readers (like Per) who pointed this one out.